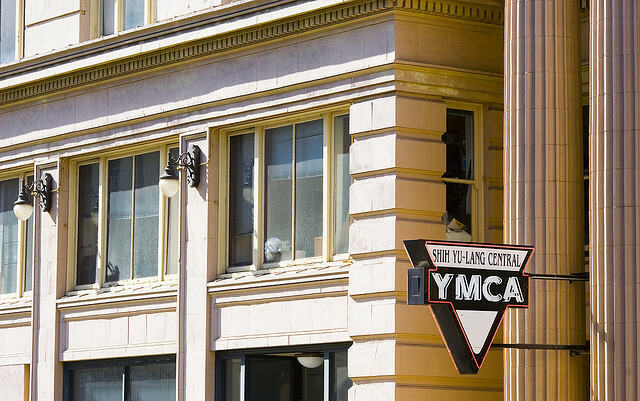 This evening, the Shih Yu-Lang Central YMCA, located at 220 Golden Gate Ave. in San Francisco’s Tenderloin district, will close its doors forever. That the administration for that branch of the YMCA felt that their history was relevant to their institution is evidenced by the fact that the “Who We Are” page on their website opens by recounting its past. Mention is made that U.S. President Howard Taft participated in its dedication in 1909; and that the Shih Yu-Lang Central YMCA has been in operation every day since its opening in 1910. A celebration is being held this evening in recognition of the Shih Yu-Lang Central YMCA’s nearly 100 years of service to San Francisco. Announcements for the celebration mention an “historical photo gallery” as part of the event. As a professional archivist, when I see announcements of exhibitions of local San Francisco historical photographs, I often wonder how those images were culled, and who had cared for them. More to the point, I wonder what becomes of those photos after the event is over. It’s always a shame when carefully gathered historic images end up being disposed of when they may have had a value to future researchers. Anyone who is considering getting rid of historic images related to San Francisco may wish to consider contacting the San Francisco History Center and inquire about the possibility of donating their materials. I just cancelled my membership there, before it closed. I hadn’t been in years. But, it was a beautiful building and this is a terrible loss. this WAS a city that cared about her beautiful and historic places. Central Y was paid for by a list of financial barons and families of the turn of the last century. There was a brass plaque with the likes of Rockafeller’s on it. The marble, and the inlay, and the mahogany. Over the decades the building was covered up and the beauty hidden by “modern” additions. But, you just know that they are all there behind the wallboard. I was a member of the Golden Gate Club. We had a separate lockerroom and a work out area. But, the impressive thing there was the toilet. The particians were solid marble walls. The wooden doors were so finely carpentered that there was almost an airlock sound when you closed them. The brass latches were old and in perfect condition. The loss of Central Y is shameful. I blame the YMCA in a small way. But, the City in a much bigger way. No outcry for the loss of yet another post-1906 rebuilding project building. A guilded age of health and fitness. AND, did you ever see a better swimming pool!!!! Tiled. Not that pressed out fiberglass or metal tin cans they make now. sigh. As one who has a few historical photographs that I wouldn’t mind donating at some point, I’ve been somewhat disillusioned at just how difficult it is to GET at materials in these institutions. Rather than treat them as public property they are treated as items of commercial value, requiring strict usage agreements and even usage payments. I’m not sure that really benefits history. On top of that, may of these institutions don’t bother to digitize their ephemera and, as you well know, this means we are losing these items, a little bit each day. If you know of an institution that truly operates in the public interest, let me know. Thank you for your post. As someone involved in archives professionally, I might be able to speak to some of your points. Although policies vary from one archives to another, visual resources such as photographs can involve a number of considerations for letting researchers use them, including copyright and cost of providing copies. Also, digitizing visual media also involves considerations related to copyright, proper cataloging of each image so that they can be searched and found, and paying the “digital mortgage” of migrating digital content to new formats as old formats become obsolete. These can involve a fair bit of money and labor. That said, you may wish to contact archives that you are considering offering photographs to as a donation and inquire about the access and use policies that they have for their photograph collections. That might help determine which repository may seem right for your offer of donation. If you have questions or concerns about how such a donation might take place, or what would become of your photographs once they were donated, I’d be happy to try to help address those.